Brown won the most recent national event at Pacific Raceways in Kent, Wash., where NHRA’s summertime three-race Western Swing concluded. Brown, who posted his first win of the season at the facility outside Seattle, took over the No. 1 position during the second qualifying session with a 1,000-foot run of 3.789-seconds at 325.45 mph. Brown, who has yet to record a pole this season, is looking to notch the 50th of his career. Brown also secured a spot among the top-10 in the upcoming NHRA Mello Yello Drag Racing Series Countdown to the Championship following the first session. Clay Millican, who led the first qualifying session, is second with a run of 3.790-seconds at 323.04 mph. Point-leader Steve Torrence is 12th after his best run of 4.445-seconds at 180.91 mph heading into Saturday’s two rounds. Robert Hight (Funny Car), Erica Enders (Pro Stock), and Matt Smith (Pro Stock Motorcycle) are also preliminary No. 1 qualifiers in their respective categories at the 17th of 24 events on the 2018 NHRA Mello Yello Drag Racing Series schedule. Leah Pritchett (Top Fuel), Alexis DeJoria (Funny Car), Tanner Gray (Pro Stock) and Jerry Savoie (Pro Stock Motorcycle) were last year’s winners of an event that will be televised on FOX Sports 1, including live final eliminations coverage starting at 2 p.m. (EDT) on Sunday. Hight leads Funny Car with his 1,000-foot run of 3.971-seconds at 326.95 mph in his Chevrolet Camaro SS. The two-time/reigning world champion has one pole this season along with two wins, three runner-up finishes to stand third in points. Matt Hagan, a two-time world champ from DSR, is second after his run of 3.990-seconds at 324.51 mph. Point-leader Courtney Force is 15th following her pass of 4.097-seconds at 313.15 mph. In addition, “Fast” Jack Beckman, the 2012 Funny Car world champion, earned his berth in the six-race Countdown after the opening qualifying session. Enders, third in Pro Stock points, is chasing her first pole of the season after covering the traditional quarter-mile in 6.609-seconds at 207.53 mph in her Camaro SS during the second session. Enders, a two-time world champ, has one win and five runnerup results this season. Chris McGaha is second with a pass of 6.613-seconds at 208.33 mph while point-leader and four-time world champ Greg Anderson is eighth following his run of 6.626 at 208.52. Smith leads Pro Stock Motorcycle after his quarter-mile run of 6.852-seconds at a track-record 198.47 mph aboard his Elite Motorsports/Denso EBR. A two-time world champion, Smith has one pole and one win this season. Hector Arana Jr. sits second at 6.877-seconds and 197.08 aboard his Buell. Eddie Krawiec, a four-time world champion, is third with his run of 6.886-seconds at 195.45 mph aboard his Screamin’ Eagle Vance & Hines Harley-Davidson Street Rod. Point-leader Andrew Hines, a five-time world champ for Harley-Davidson, is fourth following his pass of 6.899 at 195.05. FOX Sports 1 will air one hour of “Sunday Nitro” qualifying coverage at noon (EDT), followed by three hours of finals racing beginning at 2 p.m.
Top Fuel _ 1. 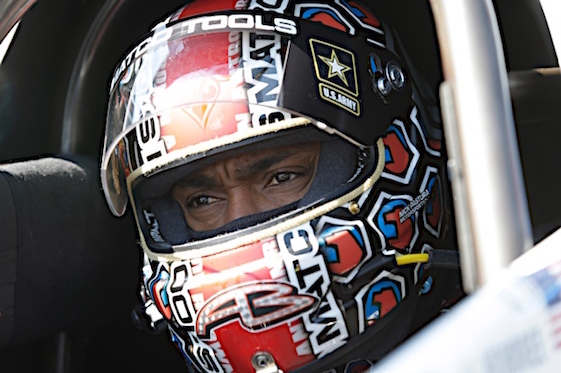 Antron Brown, 3.789-seconds, 325.45 mph; 2. Clay Millican, 3.790, 323.04; 3. Mike Salinas, 3.797, 322.19; 4. Billy Torrence, 3.823, 326.48; 5. Scott Palmer, 3.834, 318.17; 6. Leah Pritchett, 3.841, 324.83; 7. Terry McMillen, 3.846, 319.60; 8. Tony Schumacher, 3.946, 308.92; 9. Doug Kalitta, 3.947, 257.43; 10. Chris Karamesines, 4.003, 305.01; 11. Brittany Force, 4.187, 210.44; 12. Steve Torrence, 4.445, 180.91; 13. Richie Crampton, 5.024, 141.59; 14. Luigi Novelli, 5.234, 140.63; 15. Terry Totten, 12.286, 72.31. Funny Car _ 1. Robert Hight, Chevy Camaro, 3.971, 326.95; 2. Matt Hagan, Dodge Charger, 3.990, 324.51; 3. Tim Wilkerson, Ford Mustang, 3.996, 316.67; 4. Jim Campbell, Charger, 4.014, 313.15; 5. Tommy Johnson Jr., Charger, 4.017, 317.42; 6. Shawn Langdon, Toyota Camry, 4.024, 318.39; 7. Bob Tasca III, Mustang, 4.026, 318.09; 8. Ron Capps, Charger, 4.039, 311.99; 9. Jack Beckman, Charger, 4.067, 314.75; 10. J.R. Todd, Camry, 4.070, 316.67; 11. Jonnie Lindberg, Mustang, 4.081, 314.53; 12. Cruz Pedregon, Camry, 4.081, 305.84; 13. John Force, Camaro, 4.082, 321.42; 14. Courtney Force, Camaro, 4.097, 313.15; 15. Bob Bode, Charger, 4.113, 307.72; 16. Del Worsham, Camry, 4.495, 214.93. Not Qualified _ 17. Dale Creasy Jr., 4.529, 175.87; 18. Gary Densham, 5.222, 157.91. Pro Stock _ 1. Erica Enders, Chevy Camaro, 6.609, 207.53; 2. Chris McGaha, Camaro, 6.613, 208.33; 3. Alex Laughlin, Dodge Dart, 6.613, 207.59; 4. Bo Butner, Camaro, 6.614, 208.78; 5. Jason Line, Camaro, 6.622, 207.88; 6. Jeg Coughlin Jr., Camaro, 6.623, 208.23; 7. Tanner Gray, Camaro, 6.624, 208.71; 8. Greg Anderson, Camaro, 6.626, 208.52; 9. Deric Kramer, Camaro, 6.632, 208.01; 10. Drew Skillman, Camaro, 6.640, 207.72; 11. Vincent Nobile, Camaro, 6.648, 207.08; 12. Dave Connolly, Camaro, 6.659, 207.53; 13. Fernando Cuadra, Camaro, 6.683, 207.08; 14. Alan Prusiensky, Dart, 6.771, 203.80; 15. Mark Hogan, Pontiac GXP, 6.854, 200.59; 16. Dave River, Chevy Cobalt, 7.002, 197.33. Pro Stock Motorcycle _ 1. Matt Smith, Victory, 6.852, 198.47; 2. Hector Arana Jr., Buell, 6.877, 197.22; 3. Eddie Krawiec, Harley-Davidson, 6.886, 195.45; 4. Andrew Hines, Harley-Davidson, 6.899, 195.76; 5. Jerry Savoie, Suzuki, 6.909, 193.07; 6. Mark Paquette, Buell, 6.917, 193.32; 7. Joey Gladstone, Suzuki, 6.924, 193.27; 8. Angelle Sampey, Buell, 6.960, 192.58; 9. Hector Arana, Buell, 6.965, 193.90; 10. LE Tonglet, Suzuki, 6.969, 193.16; 11. Karen Stoffer, Suzuki, 6.979, 191.00; 12. Ryan Oehler, Buell, 6.985, 192.03; 13. Scotty Pollacheck, Suzuki, 6.985, 191.76; 14. Jim Underdahl, Suzuki, 6.997, 191.21; 15. Steve Johnson, Suzuki, 7.002, 191.19; 16. Angie Smith, Buell, 7.033, 189.87. Not Qualified _ 17. Kelly Clontz, 7.072, 190.35; 18. Cory Reed, 7.146, 185.36.